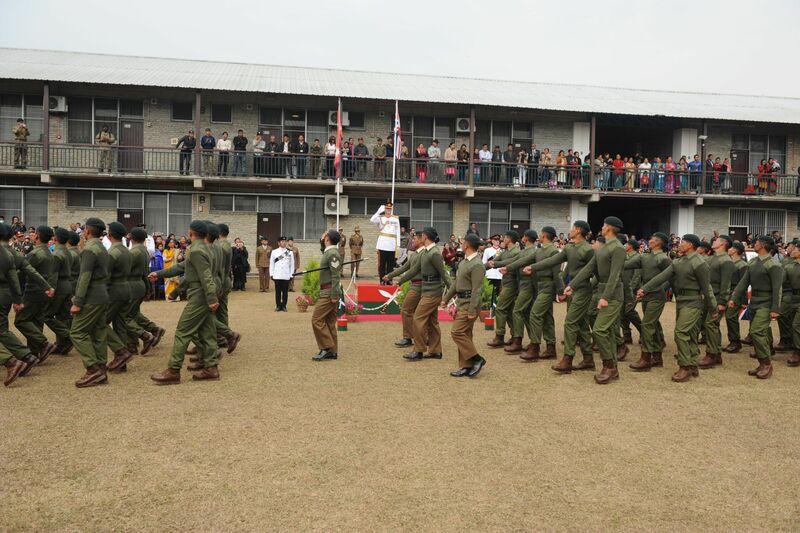 On Thursday 9th February the 2017 Attestation Parade took place at British Gurkhas Pokhara. 270 new recruits where selected through the long and arduous annual Gurkha recruit selection process. (Video made by Forces TV). All had completed regional selection and then were in the top Order of Merit for the assessments at Central Selection. This year the 270 were selected from an original application of over 8,000 – with an increase from last year’s 240 in order to meet the planned growth of the Brigade of Gurkhas over the next few years. Colonel Commandant Brigade of Gurkhas, Lieutenant General NAW Pope CBE, was the Inspecting Officer. OC Recruiting, Major James Devall, presented the parade to him and then the new recruits were inspected by General Pope, Colonel James Robinson, Colonel Ian Logan, Warrant Officer Class One Glenn Haughton (the Army Sergeant Major) and, of course, Lieutenant Colonel (Retd) John Cross. In groups of five the recruits came forward to swear their allegiance to Her Majesty The Queen. Gen Pope then spoke fluently in Gurkhali, congratulating the recruits on their success, reminding them they will become Gurkhas and will have a responsibility to maintain the special name, and for them not to forget where they come from; Nepal, and their traditions and customs. The parade was then taken over by Captain Ganeshkumar Rai, Commander of the Infantry Training Centre staff who had travelled from the UK to prepare the recruits for the next step of their journey to ITC Catterick, who then marched the parade off. The music was provided by the Pipes and Drums of the Nepalese Army who concluded the parade with a short musical display. Once the parade was complete everyone gathered around the chautara in the centre of the camp. Recruits were presented with khadas by their families and thoughts turned to flying to UK to start their training and indeed their career in the British Army.